Sheriff Joe Arpaio of Maricopa County, Arizona, famous for doing things like constructing a "tent city" jail in the middle of the Arizona desert and making his prisoners wear pink underwear, has turned his attention to dogs and cats held in his custody and arrested a fellow lawman for animal cruelty. His latest two moves have animal-lovers all over America cheering. He's cracking down on animal abuse in the area by moving dogs and cats who are victims of abuse, or that are being held as evidence in domestic violence cases, into the air-conditioned, jail where a select group of female prisoners who are busy hugging, petting and looking after these previously mistreated animals. BANDIT: The police dog died after being left unattended in a Chandler Arizona squad vehicle for almost 13 hours. Prisoners are painting the insides of the jail with pictures of trees, flowers and fire hydrants, to make the creatures feel more at home. The sheriff takes a dim view of anyone who abuses or neglects animals. Two months ago he booked Chandler police Sgt. Tom Lovejoy into jail and charged the fellow lawman with animal cruelty in connection with the death of a police dog. Lovejoy was arrested Sept. 5 after sheriff’s investigators determined that he had recklessly caused the death of a Chandler police K-9. 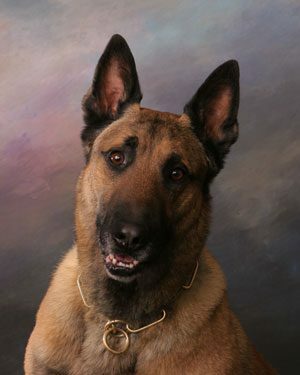 Bandit, a 5-year-old Belgian Malinois, died Aug. 11 after being left in a police vehicle parked for 13 hours outside Lovejoy’s home. Bandit’s handler and two other officers used bleach and water to clean out the vehicle, according to a sheriff’s office report. One of the officers, a commander, then paid $299 with a city credit card to have the dog cremated at a nearby veterinary clinic, the report states. The actions left little physical evidence for the Maricopa County Sheriff’s Office to examine. The Arizona Association of Chiefs of Police has come out against Arpaio’s decision to book the Chandler police Sergeant. The association believes Lovejoy should have received a citation for the misdemeanor and then been released, Ralph Tranter, executive director of AACOP told the East Valley Tribune in September.